Proper management of transitions in care — the handover of an individual’s care from one health setting to another — has the potential to dramatically hasten that person’s return to health, as well as reduce the likelihood of a return ER visit or rehospitalization. Transitions of care are a checkpoint not only to engage patients and caregivers in proper post-care but also to confirm providers have a complete picture of patients’ health so that handovers are seamless. 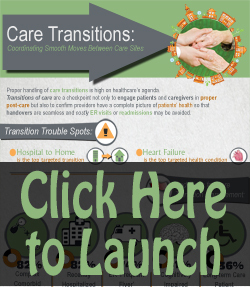 This HINfographic on care transitions illustrates the proper handling of care transitions, including transition trouble spots, red flags for care management, favored models of care, coordinators of care transitions, transition program components and barriers, and what’s working in current programs. You may also be interested in this related resource: 2013 Healthcare Benchmarks: Care Transitions Management. This entry was posted on Monday, July 1st, 2013 at 1:30 pm	and is filed under Avoidable ER Use, Care Coordination, Care Transitions, Healthcare Utilization, Hospital Readmissions, Infographics, Reducing Readmissions, Transitions in Care. You can follow any responses to this entry through the RSS 2.0 feed. Both comments and pings are currently closed.